Preparing Individuals, Organisations and Society for Success in a World of Uncertainty. 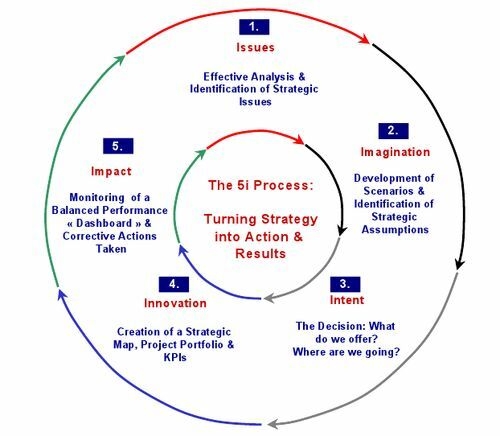 5i Strategic Affairs has been offering consulting, training, facilitation and coaching services to all types of organizations around the globe for over 20 years. It specializes in managing and optimizing the strategic planning or strategic-decision-making processes for organizational leaders irrespective of their field of activity. What differentiates 5i from its competitors? Its expertise in identifying, challenging and validating the prevailing "Strategic Assumptions" behind a client's beliefs, preferences and decisions. Its understanding that organizations are more than just the numbers. The numbers are but one (important) outcome from the successful implementation of the best possible way of solving an organization's issues and problems . We identify the key issues that affect the organization's performance and available alternatives. We identify, examine and evaluate all possible outcomes, given the situation and all alternatives available to the organization. The prevailing “Strategic Assumptions” are identified, challenged and validated. We guide and support the decision-making process, helping to make critical decisions concerning the direction of the organization in light of identified issues and alternatives. We develop a viable implementation plan and project portfolio complete with performance indicators and targets to help the organization realize its goals. We monitor progress, take corrective action and offer individual and/or multi-level organizational support and coaching to principals and staff to ensure that all the performance objectives are achieved. "Presence: Knowing what is happening to your experience in real-time"
"We cannot predict what will happen in the future....but we still need to be ready for it"
"We must be learning from the Future - not from the Past or Present"
"Challenging our Strategic Assumptions leads to renewal"
"Most of us spend 50-80% of our time at work in conversation trying - in vain - to create value"
"Innovative ideas originate from asking different questions and hosting new conversations"
"Implementation is a key consideration in strategy formulation"
"The days of an executive team taking important strategic decisions alone is over "
"Do you really treat your employees as your most important asset?."